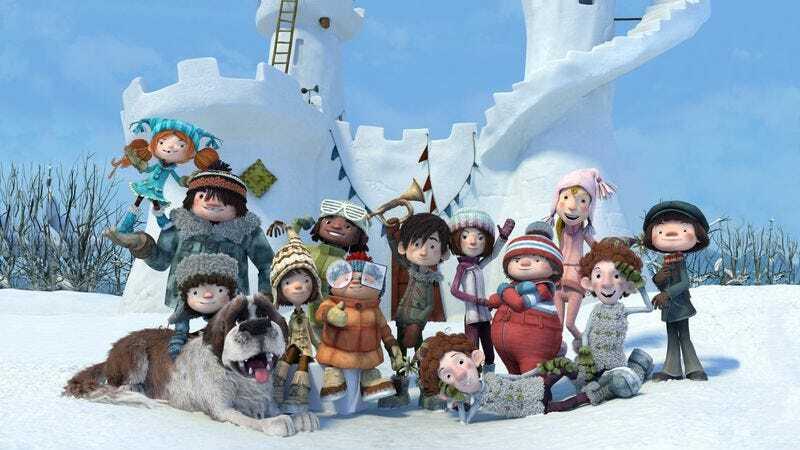 U.S. audiences won’t get much out of the Canadian animated film Snowtime! Other countries’ beloved cultural touchstones aren’t always easy for outsiders to understand. Canadians, for example, are extremely partial to a Québécois children’s story about two gangs of little kids who engage in a massive multi-day snowball fight, with ultimately tragic results. La Guerre Des Tuques (which translates as The War Of Canadian Knit Caps, more or less; in America it was retitled The Dog Who Stopped The War) was originally filmed as live action, and was the highest-grossing Canadian film of 1984. 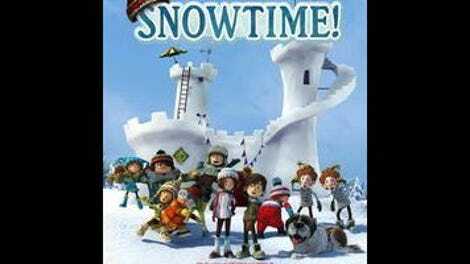 Last year saw the release of a 3-D animated remake telling the same story (revised English title: Snowtime! ), and it, too, was a huge box-office success (though there’s some controversy regarding whether it or Brooklyn—an Irish-Canadian co-production—is Canada’s top grosser for 2015). Did nostalgia have something to do with it, or does this particular subject resonate with the homegrown crowd in a way that others can’t readily appreciate? Whatever the case may be, Snowtime! is likely to have roughly the same impact in the U.S. that The Dog Who Stopped The War did three decades ago—which is to say, little or none. Set in a Peanuts-style world with no visible adults, the film kicks off with the arrival in town of two girls, Sophie (Lucinda Davis) and her bratty younger sister Lucy (Angela Gallupo). Both are immediate objects of curiosity in this boy-heavy burg, and wind up being drafted into the local kids’ elaborate plans for a fun winter vacation: One small group will build an enormous snow fort, and the rest will attack it. The terminally bland ensemble includes Frankie (Sandra Oh—as is often the case in animation, some of the boys are voiced by women), a nerdy genius who designs the fort; Luke (Gallupo again), the gung-ho leader of the invaders; Chuck (Don Shepherd), a genial lummox; and Piers (Ross Lynch), whose Saint Bernard, Cleo, serves as a mascot when she’s not farting in people’s faces. (The film has no shame about pandering to the taste of small children.) What starts out as fun and games, however, takes a more serious turn after a misunderstanding inspires both sides to escalate matters into a full-blown arms race. Like the original live-action film, Snowtime! does something genuinely bold (for a children’s film) with its finale, and that’s probably a large part of the story’s enduring appeal. Getting to that cathartic anti-war statement, however, is mostly a slog. The blocky, pseudo-puppet animation style looks like Saturday morning TV, which becomes even more apparent during a brief flashback sequence rendered in lovely watercolor. Dialogue is witless (though at least there are no pop-culture references), and the kids are all generic types with pre-packaged personalities. In fact, there’s so little going on underneath the slim narrative that a romantic subplot involving two of the older kids, Sophie and Luke, sets a new, seriously creepy record for most screen time devoted to animated characters making goo-goo eyes at each other. Oh, and there are several cutesy musical montages set to such Canadian artists as Walk Off The Earth, Simple Plan, and Celine Dion. Unless you, too, are Canadian, or somehow grew up with this story elsewhere, or are 6 years old and inordinately amused by dog farts, there’s nothing much here for you.